Hours: No name, no hours. My best guess is just before lunch to mid-afternoon. Green factor: Aluminum foil for burgers, Styrofoam for poutine, paper containers and bags for fries. Garbage bin only. At the end of Booth Street near Dow’s Lake, amidst brick buildings full of diligent bureaucrats, are two chip wagons. Neither are much to look at – unless you count the bright colours that they’re painted in to catch your eye – and one is a bit more mysterious than the other. With no name, nor any posted hours, this blue and yellow chip-slinger is a bit of a question mark. Well, unless you’re one of the many civil servants who frequent this truck – of which there were several on the day of my visit, even on a Monday afternoon after the lunch rush. Ol’ Boothy (as I will call this truck hence forth) is as basic a chip wagon as you would expect, given the lack of a formal moniker or anything close to marketing information. 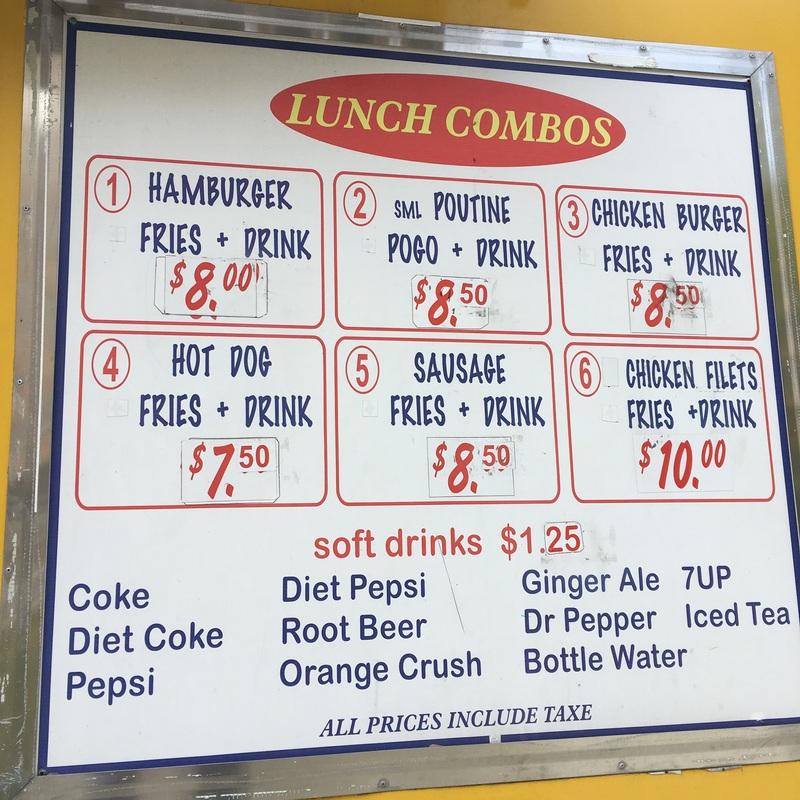 The menu is comprised of all the healthy items you would expect – burgers, fries, poutine, hotdogs and sausages, pogos, and if you’re on a diet, there’s also chicken burgers and tenders. One of the benefits of being a nameless business is that you can take the money that you would have spent on silly things like branding and letting people know when you’re open, and pass those savings along to your customers! 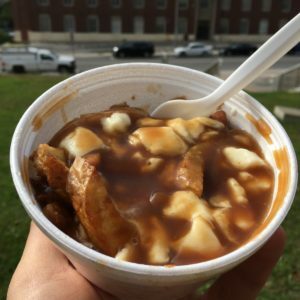 A large poutine is a mere $7, and combos with the aforementioned items, plus fries and drink, range from $8 – $10 (taxes in). 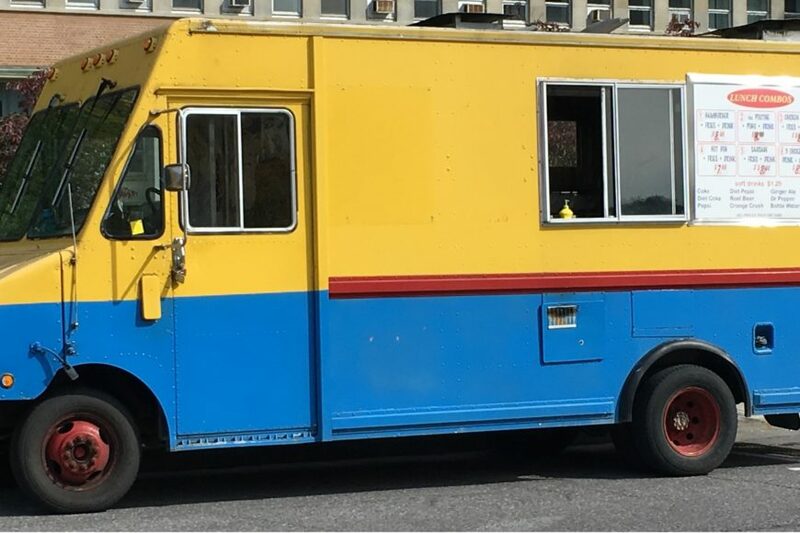 I’ll give it to the owner of this truck, he knows what civil servants want – cheap eats that provide immediate gratification to our grease-loving brains. I ordered a cheeseburger combo, with the fries upgraded to a poutine ($9 total), and a water to wash down my carbs and meat. It was a bit of a wait with a few orders ahead of mine, but I soon had my food in hand and moseyed to a nearby bench to have my first meal of the day (don’t judge me!). 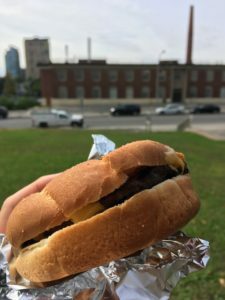 The burger was a surprise – artisanal bun, with house-ground, grass-fed beef, and aged cheddar. Just kidding, it was a D’Italiano bun with a from-frozen, processed patty, but honestly it wasn’t half bad. The patty wasn’t the cheapest nightmare from the freezer section (I’m looking at you, Sunrise), and was cooked nicely on the grill. With its melty cheese and a squirt of mustard, this would have been a solid diner-style burger if it had some sautéed onions, and relish or pickles. I’d compare it to a burger at a BBQ where the cook knows their way around the grill, but doesn’t like his guests enough to go all-out on the ingredients. Potato salads are healthy, right? Locked away in a Styrofoam cup, the poutine was still quite hot by the time I got around to it. The gravy was a bit on the salty side – and I wouldn’t be surprised if it was made from a powder – but like the burger, I’ve had worse. The fries were hand-cut and golden brown, and the cheese curds were plentiful and surprisingly squeaky, given Ol’ Boothy’s general circumstances. This may not be an award-winning poutine, but it was still better than the shredded cheese abominations you come across back on the east coast. Ol’ Boothy may not have a name, posted hours, social media presence, or even show up on Google Maps, but for people in the area looking for a decent meal for under $10, it’s certainly on their radar.